A creamy brown sauce with green peppercorns. Perfect over beef. 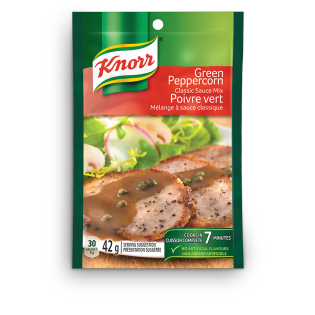 Knorr offers six varieties of sauce mixes so you will be sure to find flavours your family will love. Maltodextrin, wheat flour, corn starch, natural flavour, salt, hydrolyzed soy/corn/wheat protein , monosodium glutamate, modified milk ingredients, beef fat, dried green peppercorns, colour, guar gum, sugar, onion & garlic powder, spice, yeast extract, disodium guanylate, disodium inosinate and sulphites. 1. In saucepan, whisk sauce mix into ⅔ cup (150 mL) each cold water and milk until blended. 2. Whisking constantly, bring to boil over medium âhigh heat. 3. Reduce heat and simmer 3 minutes, whisking occasionally. Makes 1 ¼ cups (300 mL) sauce.